EARRINGS - SARAH COVENTRY. "CHAIN-ABILITY" FROM 1971. 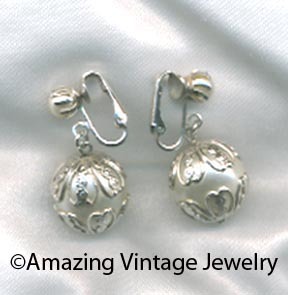 SILVERTONE FAUX PEARL DANGLES ENCASED IN SILVERTONE FILIGREE IN A VERY CLASSIC, TRADITIONAL LOOK. CLIP. 1 1/2" LONG, 5/8" IN DIAMETER. VERY GOOD CONDITION.